So Much to Like – Run. Ride. Roam. There sure was so much to like today, right from the start! I was woken at 5:00am by the sound of rain above and since it wasn’t going to stop, I sure wasn’t going to get back to sleep. The good thing about our little apartment though, is that I could get up and go downstairs and have a cup of tea, without disturbing Steve, who managed to sleep through the rain and the accompanying thunder and lightning that soon followed! I sat with my tea, which I enjoyed in a real cup and listened to the sky turn on its theatrics outside, until Steve padded down the staircase a few hours later. Then we had a lovely, relaxing, slow paced morning. A ‘take-your-time’ breakfast, followed by a ‘whenever-you’re-ready’ shower, followed by an ‘I-think-I’ll-have-another-one’ cup of tea, then a ‘there’s-no-hurry’ elevenses. It was such a luxury and so nice not to be rushing or packing up, so we made the most of it, by having a very leisurely morning. We eventually headed out the door for some roaming. We began with a walk to a vegan cafe for lunch. This was Steve’s decision, because he liked the one we went to in Padova from the same chain, so when we were deciding what to do for lunch, his suggestion was, “Is there a Universo Vegano here? Let’s go there.” So we did. Steve enjoyed another mushroom burger and I had some soup, because it was still a bit chilly, then we were all fuelled up and ready to roam. 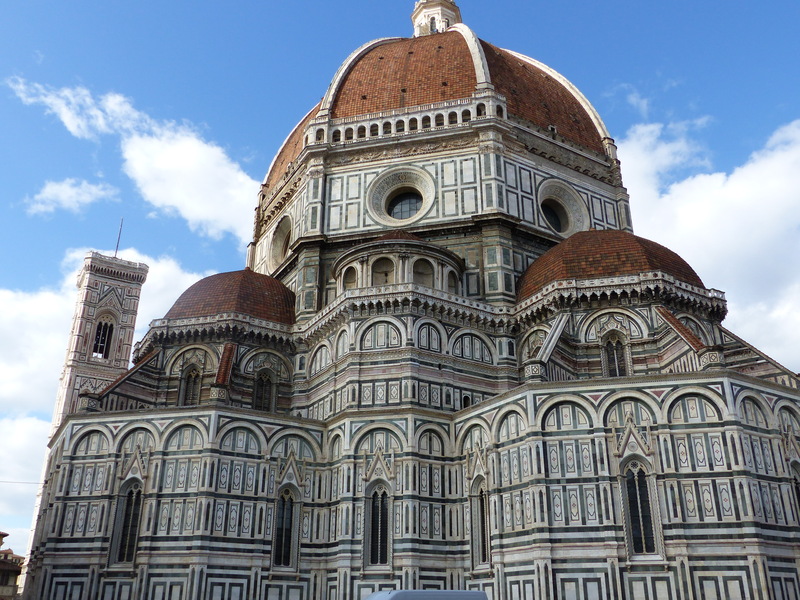 We wandered around the streets and then walked around the grand and magnificent Duomo again, from different directions. Throughout the strolling, that good vibe remained. 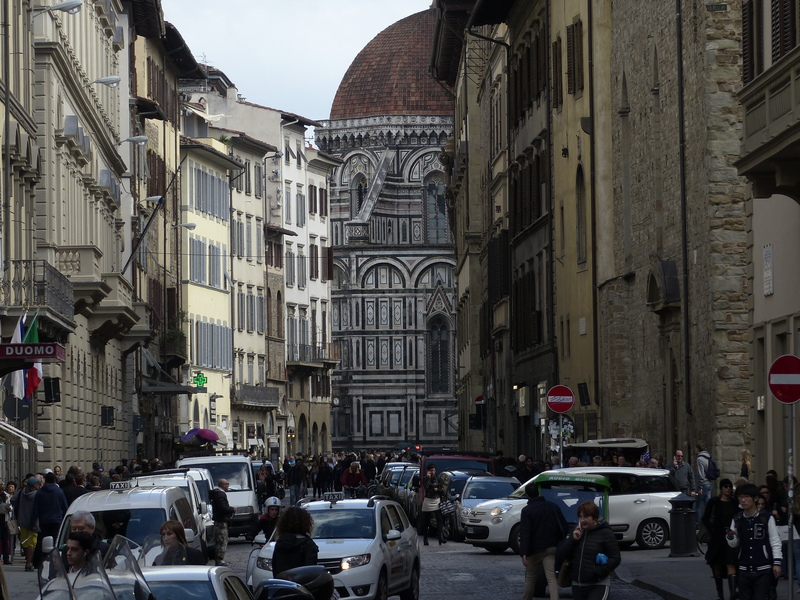 Florence felt like a good place to be and we continued to enjoy this city with its mix of vibrancy, history, old and new. There were a lot of people and many tourists, but not so many as to feel pushed and shoved and crowded and we tend to dodge the main tourist attractions anyway, so we had a very enjoyable and easy wander through this remarkable city. Time to visit a museum! We haven’t been to a museum since Pat was kind enough to take us to one in Mechelen, so it was time to top up our learnin’ and culture! 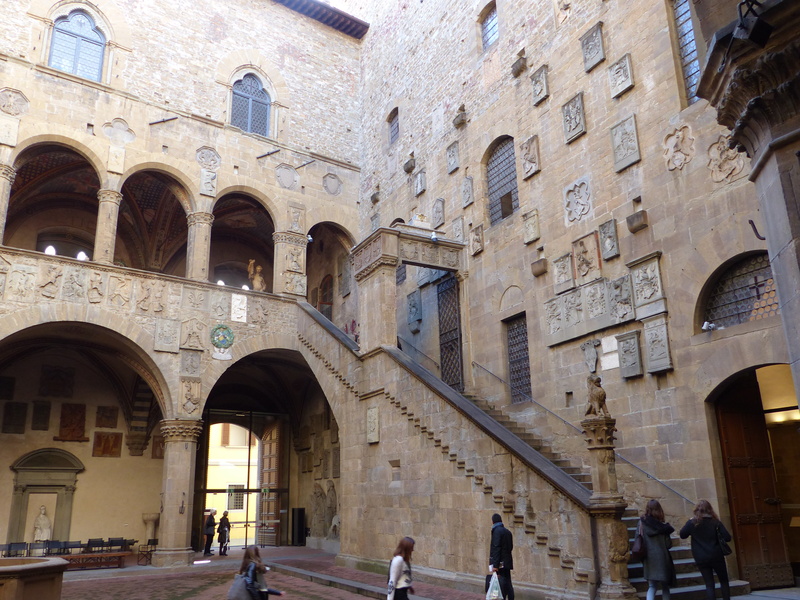 We decided to give the biggies a miss today and instead we visited the more understated Museo Nazionale del Bargello. I really liked this art museum, it had some amazing exhibits and there were no crowds at all, in fact the visitors were very light on, considering the numbers in the street, so it was an easy stroll through the halls and corridors. The entrance itself was quite stunning, with its open, internal courtyard and staircase and ornate ceilings. I was again staggered by the age of some of the things we were looking at, and it was a really interesting few hours. One of the things I’ve loved about our travels, are the connections we make along the way, when we see things that connect the dots to others things and separate pieces join together and fall into place. 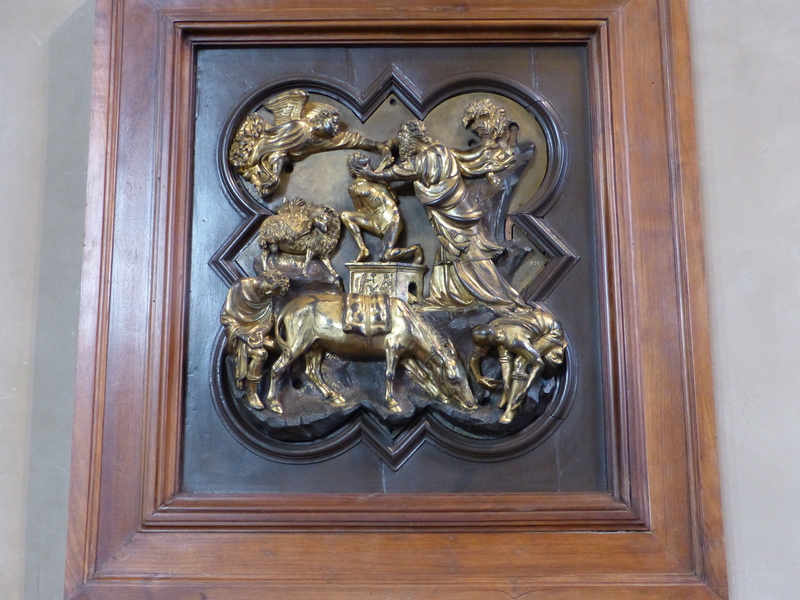 When we were in Mechelen, Pat took us to the De Wit Tapestry Maunfacturers and Museum, which was an amazing place to visit. 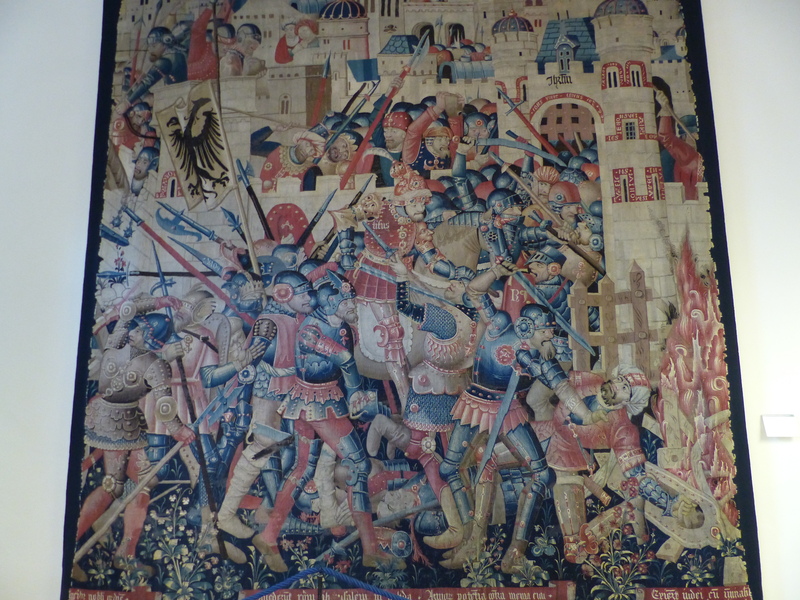 Today, one of the exhibits was ‘The Destruction of Jerusalem by Titus’ Army’, a Franco-Flemish tapestry created in Tournai, Belgium in 1480. Ping-ping some dots connected there. I immediately thought back to out visit to Mechelen and what we learned about the tapestries and the weaving process at De Wit and looked at this Flemish tapestry with totally different eyes and thoughts, thanks to that background experience. Then, walking through a hall, we saw cases of glass on display. Ping-Ping, some more dots just lined up. 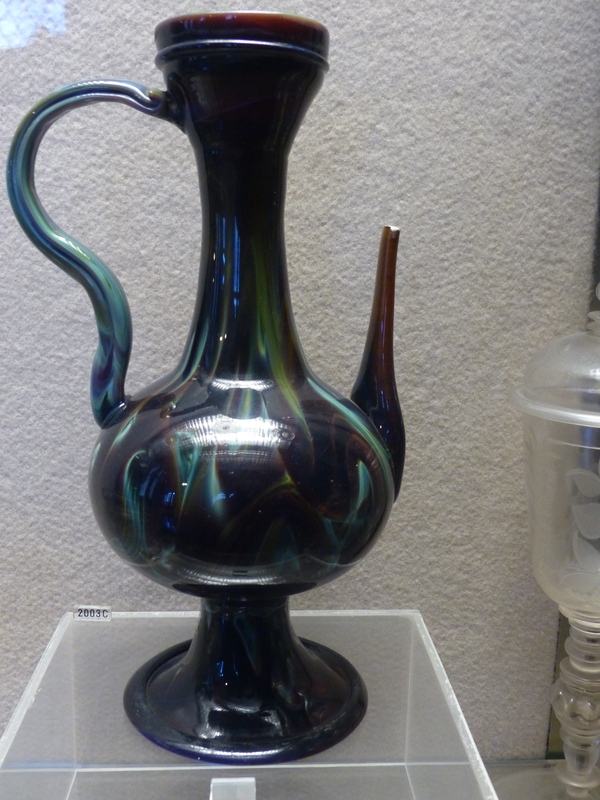 This was Murano glass, created on the island of Murano off Venice, that we had visited just a couple of weeks ago. It’s such a different experience, when we get to see things that we have some prior knowledge of, or can relate to in some connected or personal way. I loved that experience today. 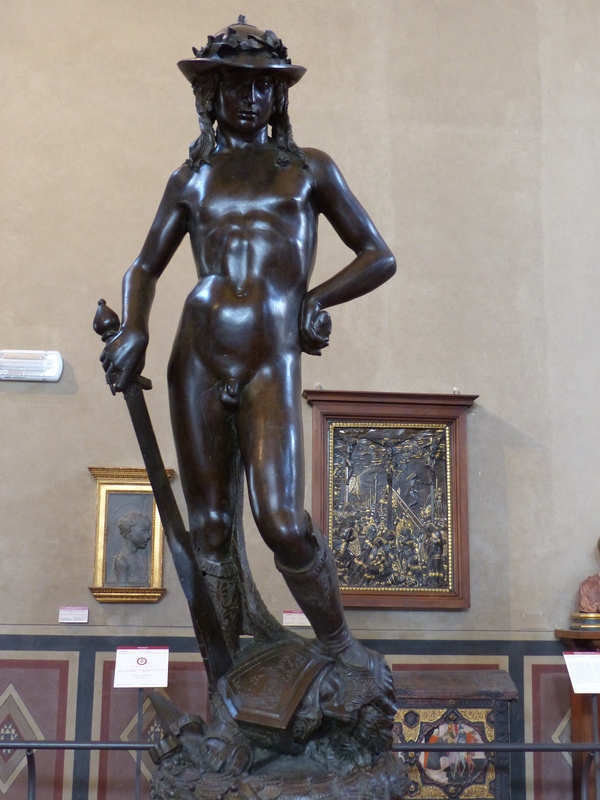 We had seen Michelangelo’s David yesterday and today we saw the other famous representation of this figure, Donatello’s David. 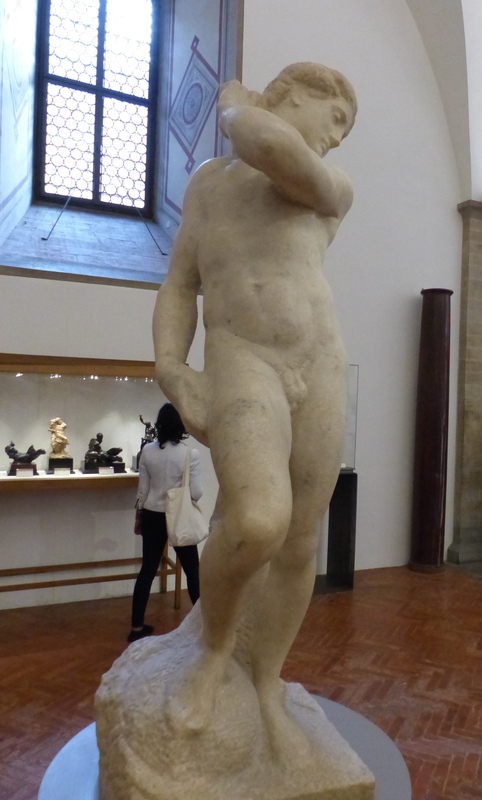 We also saw a couple of other works of Michelangelo’s, including this unfinished piece, which is thought to be either Apollo in the act of taking a bow from his quiver, or possibly David, with Goliath’s head at his feet. 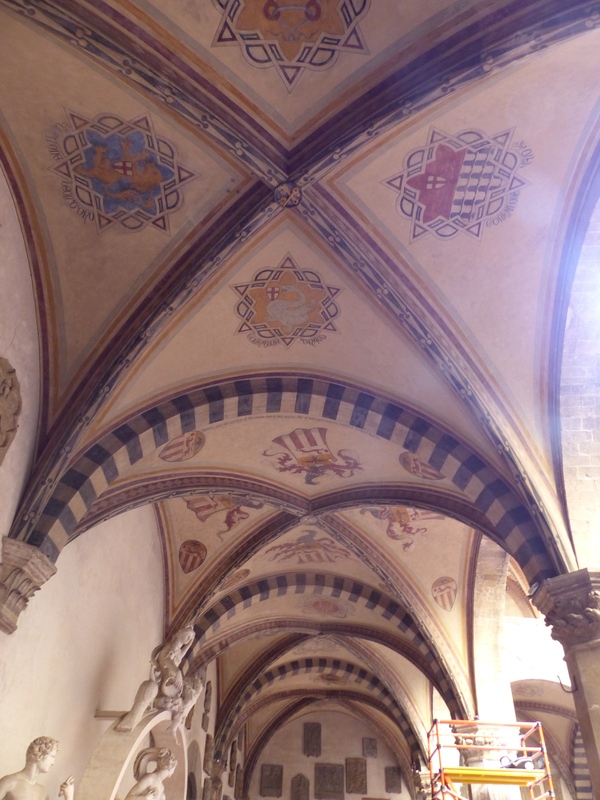 I think my favourite room, was the chapel of frescos. The building housing the museum was a former barracks and prison. One room was the chapel that was used to house prisoners awaiting execution. 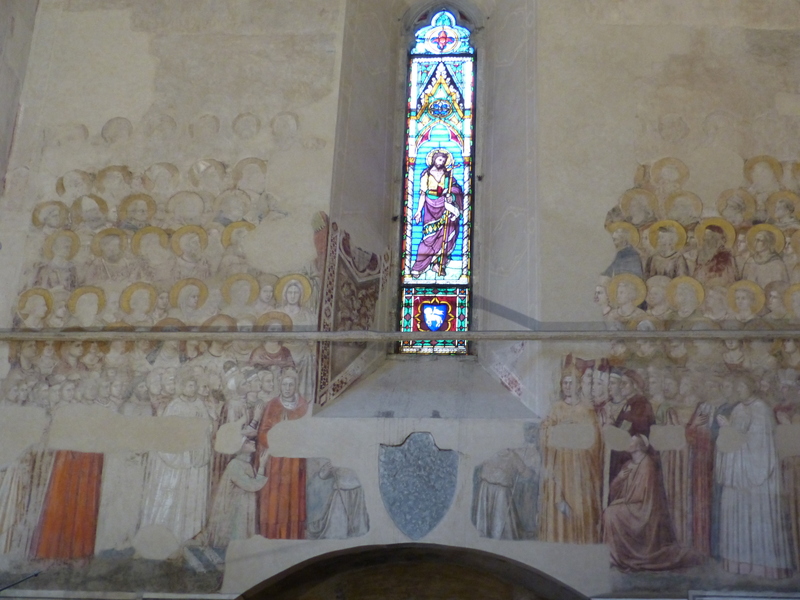 When the building was turned into a prison in the 1200’s, the frescos on the walls were plastered over, but then in the 1400’s one was discovered. The process of uncovering the remaining images then began. I loved standing there, looking up at the beautiful paintings, slowly emerging from behind the plaster, that had hidden them for so long. 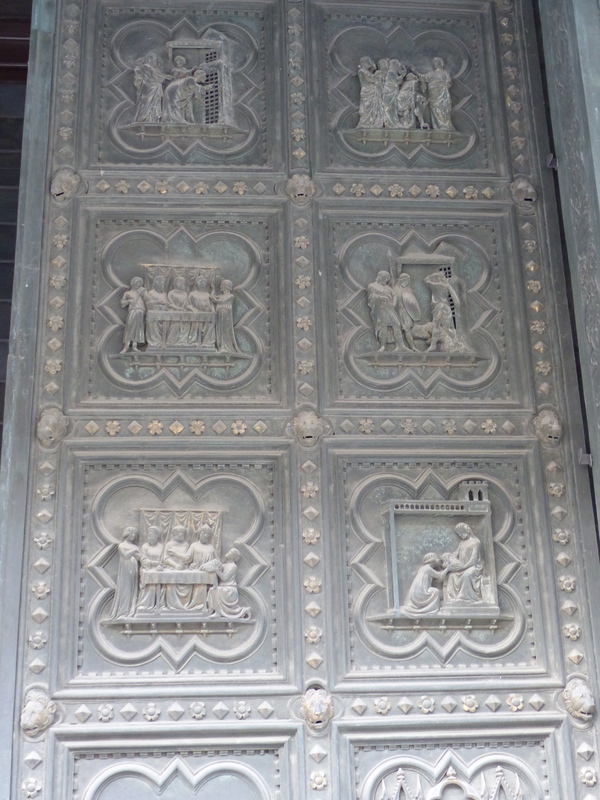 After a really interesting visit to this small, less popular but excellent museum, we continued roaming and strolled over to the Baptistry of Saint John to see the famous doors. 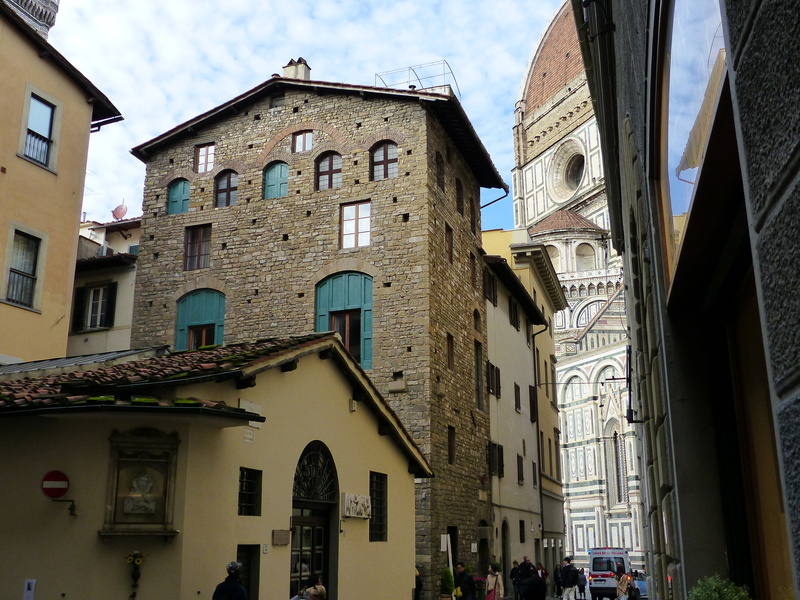 The building itself is one of the oldest in Florence, with construction beginning in 1059. We couldn’t see much of the building, or even all the doors, because it was covered in scaffolding, but we could get a glimpse of some of South doors. A competition was held for the commission of the panels and we saw some of the “losing entries” in the museum we had just come from. From there we just took a leisurely stroll to the grocery store for some supper supplies, then wandered back to our apartment. But then…something brilliant happened! Just down the street from our apartment, we had seen a small shoe repair shop, so on our walk back, we stopped and Steve went in, on the off chance, to see if they could do anything for his threadbare sandals. Can they fix them? Yes they can! Steve stood there in the shop, in his socks, while the man stitched and repaired his sandals there and then, on the spot! All fixed for the princely sum of €5.00! No more gaffer tape! No more walking at half pace because of loose, torn shoes flapping around on his feet. No more worrying about them breaking and having no shoes, because we’ve discovered there is no such thing as a size 15 in Italy! So, just like that, the problem was solved! Mind you, the sandals may have been fixed, but I reckon those brown socks will still make an appearance! What a top day! 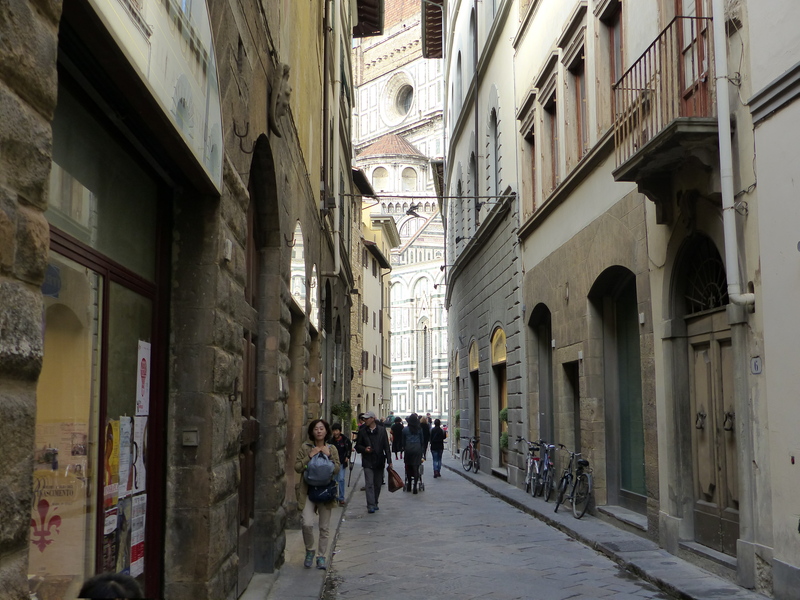 A delightful morning of leisurely luxury in our nice, cosy little apartment, an enjoyable stroll, some learning in a really interesting museum, a tasty lunch and an easy stroll through the back streets before returning to our little Firenze apartment. All capped off with the super event of the day…the sandal solution! Florence is still growing on us and we love what we’ve seen so far. Tomorrow we will venture forth into more roaming territory, experience the sights and sounds of this city and let our senses take it in, in all its splendour. Florence is ours for another day, and it is paying us with some memorable moments. We’re pocketing that gold we’re collecting and greedy for more, but Florence has the riches to spare in the magic moments, of that I’m sure!